Continuing on my mission to visit and blog about all of my local breweries, I recently popped along to Longdog Brewery in Basingstoke to meet the brewer, Phil Robins. Phil is an experienced home brewer who when recently presented with an opportunity to follow his dream of owning and running a commercial brewery, jumped in with both feet and hasn't looked back. Longdog Brewery is the youngest of the North East Hants/Surrey Border breweries and produced its first brew less than a year ago, in July 2011. 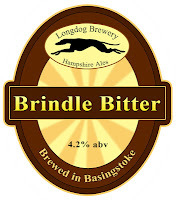 This was their flagship brew, Brindle Bitter, which has gone on to become a popular beer in terms of sales, with a strong local following. The first thing that struck me about Phil was his obvious love of what he does and indeed all things beer. He talked about his brewing equipment as one might a first offspring and was genuinely interested in my recent home brewing adventures (he also runs Basingstoke's home brew club), offering up tips and advice learned the hard way throughout his 20 odd years of garage alchemy. One of the core values Longdog lives by, is a desire to serve the local community first and foremost. In fact, as we chatted away, it reminded me of the first time I met David and Chrissy at Crondall Brewery. Phil is actively involved in the community and to serve it through his passion for beer is a natural extension of that. The brewery itself is located on an industrial estate, beneath a snooker club. The snooker club may be Longdog's nearest customer but is certainly not the easiest delivery, involving lugging casks up a fire escape! The unit they are in is quite large with lots of open space providing room for future expansion. The photo below shows the rear of the unit. Not shown is an office to the left and the loading bay to the front. The equipment was purpose built by a local supplier. The two vessels on the right hand side are fermenting vessels, which feature a double-skin sandwiching copper tubing used to regulate temperature. To the rear are storage rooms, including a cold store. 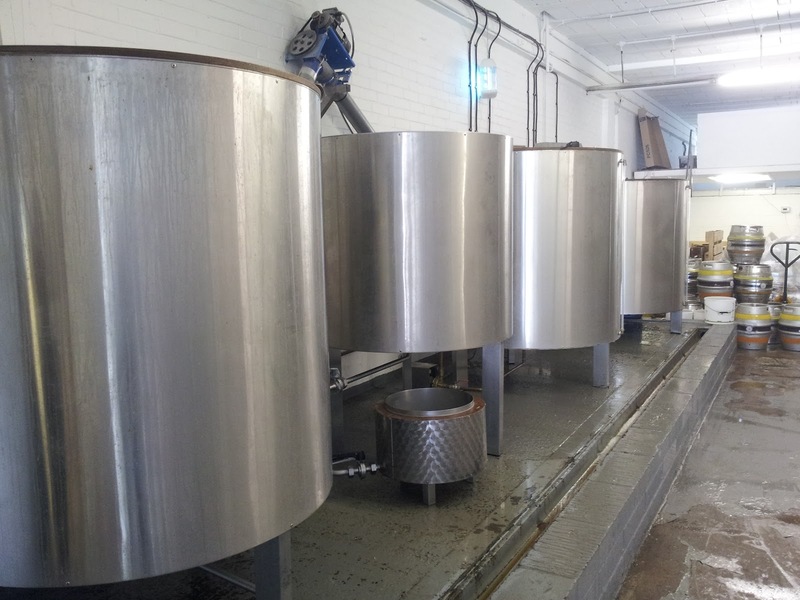 The photo below shows the four vessels on the left hand side which, back to front, are the cold liquor tank, hot liquor tank, mash tun and kettle. The kit features some nice 'green' touches such as recycling hot water from the chiller unit back into the HLT. Further over to the right is the bottling area, although Phil was quick to point out that as yet, he hasn't distributed these very far. 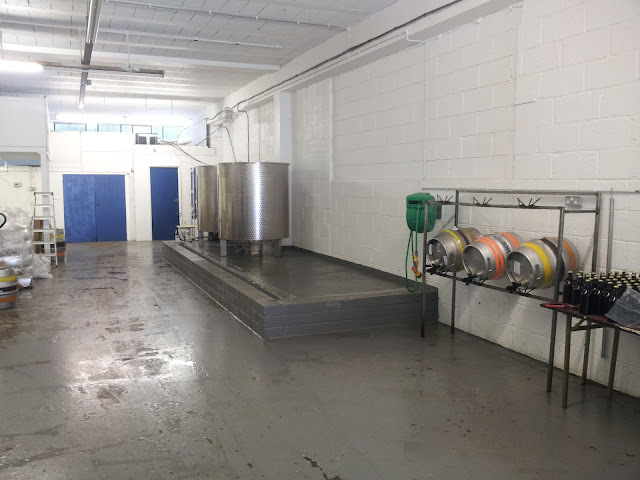 We spent some time talking about the logistical challenges of starting a brewery. Beyond the brewing equipment, inventory management of the 200 casks purchased from their initial capital investment is proving to be a difficult and time-consuming task and Longdog are having to supplement their own casks using a rental service. Longdog's own casks have turned up as far afield as Birmingham, which is a source of frustration and of course additional cost to repatriate them. It struck me that this must be a challenge for every start-up brewery and got me wondering if the various cask watch schemes should prioritise their efforts on their smaller customers rather than the big boys. Phil tracks his inventory closely and manages delivery and collection personally, which mostly works well with his local customer base but will no doubt become more difficult as the operation expands. 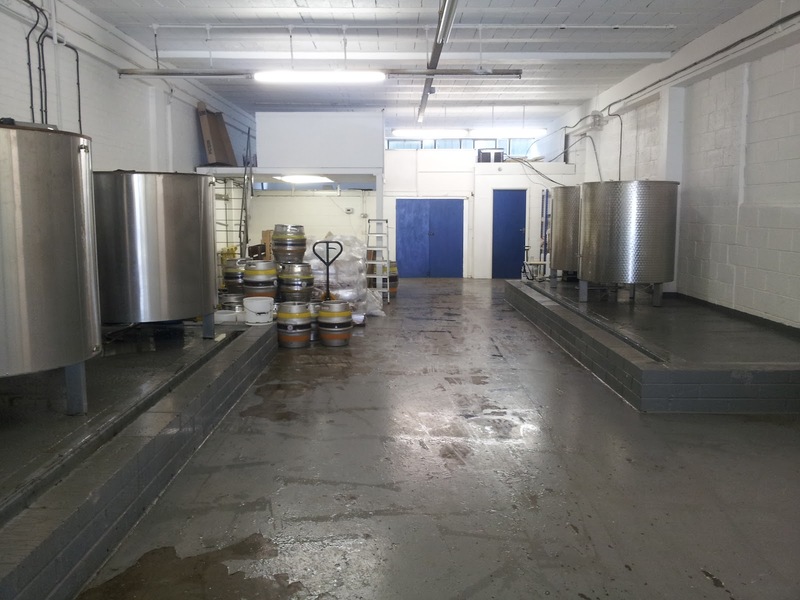 The brewery recently obtained a premises license and will soon be selling to the public directly. The intention is to sell bright beer in polypins and smaller containers. Longdog trialled this for the Christmas rush and the response from the local community was good, which Phil was encouraged by and hopes will provide a steady revenue stream as well as helping to get his brews 'out there' to aid sales in pubs. The beers themselves are based on scaled up recipes finely tuned throughout Phil's home brewing career. Longdog's Lamplight Porter, based on a very traditional 19th century recipe, has been getting a lot of attention of late, having recently won best of category at Reading Beer Festival and featuring among the best overall beers. Their original production plan was to brew this only during the colder months but demand has changed that - a nice problem to have to deal with. While I was there, Phil offered me a taste of Golden Poacher, their 3.9% golden ale, described as a 'the perfect thirst quencher' and another popular brew. This had a lovely rasping bitter finish, provided by the Green Bullet hops which also give it a fresh cut grass and citrus fruit aroma - very sessionable. In terms of future plans, the aim is to continue to create polished examples of good British styles and provide them to the local market. Phil noted that he'd also like to revisit the branding in future. The Longdog name is one he used to use for his home brew creations, inspired by his beloved canine friend. When starting the brewery, they needed a name and it 'kind of stuck'. The pump clips were created by Phil, in the traditional British style. Personally I think the overall branding works well. Longdog's first year has certainly been a good one and I'd like to wish them every success in the coming years. They're certainly a very welcome addition to the local brewing scene and it's great to see a local home brewer taking the plunge into commercial brewing.